Her: How do we solve the range anxiety issue? Me: First, we stop talking about anxiety. Her: It has to be addressed; what do we call it? Me: We want to build people's range confidence. Her: How do we do that? Let's elaborate on these three points. Having unreliable EV infrastructure is in many ways worse than not having any at all. If there were no documented infrastructure, you would not make trip plans that relied upon it. However, if you think there is a series of charging stations that can take you on a 500 mile trek and it turns out that you coast into a station with a depleted battery, only to find that it is not working, this can be an infuriating experience. If you want to find charging stations, you need two things: a smartphone & the Recargo Plugshare app. Plugshare is by far the best app out there to find charging stations. You can look at the recent check-ins and see if the last few charge events were successful, what comments people are leaving, and more. This will let you know not just what the supplier is telling you about the station's status, but also what other drivers are saying. In dash nav with charging station locations is convenient, but it is not as up to date as a crowdsourced app and they don't give you the hints needed for the hard to find stations (e.g., on what level of the parking garage should I look for it?). 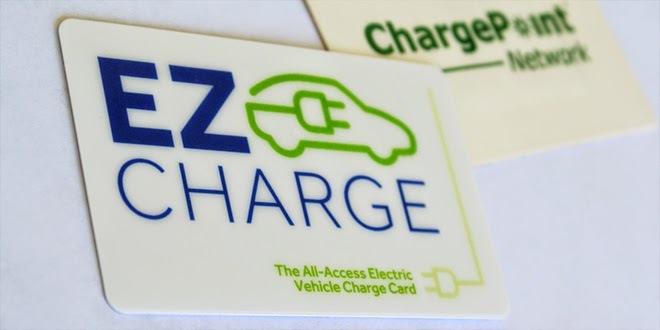 It would be a lot easier if there were a single card that can be used at all of the major charging networks. Even if new drivers had a single card, it is more important that they get a period of time when it is free to use this public infrastructure. Continuing the discussion above, I then told the story of how for the first two years (2011-2013) that I drove my 2011 Nissan Leaf, I would seek out charging stations. It was a fun game. I wanted to know where they were, I wanted to know which ones worked with my car. I liked driving my new car and this was a reason to do so. If there is a charging station within 40 miles of my house, I have probably been there. For me, during these two years, all of the infrastructure use was free. The networks were new and just getting built out. As soon as the fees began, I stopped looking for new stations. It was cheaper to charge up in my garage. But by then, I knew where the stations were and I was comfortable using them. I knew that if my range was getting low, that there were dozens of places that I could stop to grab a few Watt-hours. New drivers need a similar free experience to encourage them to explore. Once they know the infrastructure is out there, they will be confident in the safety-net that it provides. 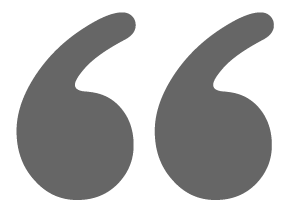 The above outline is easy to say, but to make it happen, the dealerships will have to drive it. You often see "free oil changes for 3 years" or similar offers for new cars. EV charging is even cheaper. If the auto dealers are serious about selling EVs, they cannot ignore the infrastructure. They have more skin in that game than I think they realize. Robust, healthy EV infrastructure makes plug-in cars more usable and more comfortable. It removes that uneasy tinge that many new EV drivers feel. How can the auto-makers help make this happen? They could roll out their own charging network like Tesla is doing. Or for the major EVSE providers, they should make an investment in the company and get a seat on the board of directors. From there, they can push for quality, reliability, and "uptime" metrics. These data should be in quarterly earnings reports. I like to think that the above conversation led to the creation of the EZ-Charge and "No Charge To Charge" programs that started in July of 2014. It is not free charging for life, like the Tesla superchargers, but it is long enough that new drivers will be old hands at using public infrastructure by the time their free period expires. This is what is needed to move from range anxious to range confident. On a rainy day in May of 2014, I snapped the above photo and walked into the dealership to check out the new Electric Fiat. I was disappointed to learn that the car had not yet arrived. I asked why they put up the sign if the car was not there. They said it was coming soon and they were getting ready for it. I guess signs are a little easier to ship than cars. I've heard of many bait-and-switch halo-car stories and I was wondering if this dealership was playing the same unscrupulous game. I was happily surprised that they did not try to talk me into buying one of their gas cars. Rather, they took down my information and told me that they'd call when the 500e arrived. True to their word, they called two months later; the car had arrived and they had three on the lot. Upon arriving, the first thing I saw was another sign, although this time behind it, I found two 500e. They said that they had received 9 and immediately delivered 6 of them. These two were for sale, one was the dealership's show car, and 14 more were coming. They predict that plug-in vehicles will remain a niche product and that there will be more Hydrogen-powered cars on the road than battery electric cars by 2035. As I have said before, predicting the future is hard and the only thing you can be sure of with detailed long term predictions is that you will be wrong. Looking at the above chart, I started to wonder what would make me drive a H2 vehicle. I have no plans to ever buy an H2 car; I am an EV fan. After some contemplation, the answer to what would it take to make me consider a FCV was "if I could plug it in". A FCV that you can plug-in. 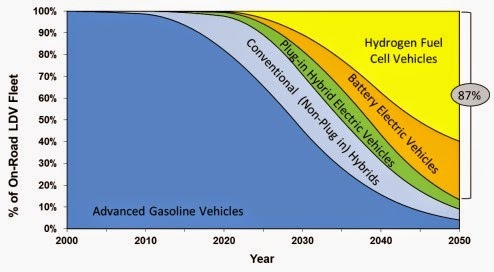 They don't have a section on the above chart for Plug-in Hybrid Fuel Cell (PHFC?) vehicles or Plug-in Hydrogen Vehicle (PH2V?). Why not? What would a PHFC look like? I would only buy a hydrogen-powered vehicle if I could plug it in. How would you make a Plug-in Hydrogen Vehicle? The initial idea for the Chevy Volt was a design where the range extender could be any mobile electricity source. The architecture, now called Voltec, was initially called E-Flex for this very reason. Although the Voltec instantiation of E-Flex takes advantage of the internal combustion engine to optimize some cases, this is not a requirement of the E-Flex architecture. This means, with a few changes, the gas genset could be replaced with a fuel cell. So a Plug-in Hydrogen Vehicle is technically possible. Assuming that North American had a complete Hydrogen refueling infrastructure (which is a big assumption); I could, one day in 2045, see myself considering a car that had 100 miles of electric range with a 200 to 300 mile H2 range extender. I don't ever want to give up the advantage of being able to "refuel" in my garage. There are several reasons that a (currently fictional) plug-in Hydrogen vehicle is far more appealing to me than a pure H2 vehicle. With an adequate electric range, the PHFC car would be able to meet all the normal driving needs that I use my Leaf for today AND with the fast refueling range extender, I would be able to drive across the country if I so wanted. Being able to "fill up" at home, is important to me. It is far more convenient than going to a filling station. Just plug in the car when you get home and it starts out every morning with a full charge. When charging at home, I know the source of the energy. I know how much energy my solar panels are producing, I know what green energy option I am paying for from the local utility. Whereas H2 will likely be natural gas sourced for many years. The final reason that I would want all but the occasional road-trip to be electrically powered, is that it is far cheaper to drive on solar energy that I generate on my roof than anything I'll ever be able to buy at a filling station. Hydrogen is projected to be the per mile equivalent cost of about $4 per gallon gasoline. Depending on your local rates, driving a plug-in car is the equivalent of $1-$2 dollars per gallon. Off-peak charging can cut that in half. Installing solar panel that you own, can make it zero. I have previously written that FCVs will never be viable. But, what would it take to get me to buy one? These seem simple, just two things: a car and someplace to fill it, but I am asking for an infrastructure system that would cost billions and a car that no one currently plans to build, as far as I know. Hey, I'll give them 30 years to complete these two nearly impossible tasks. In the meantime, I'll keep driving electric with only the occasional gas car use.